If You Can't Afford To Live Here, Mo-o-ove!! From June 7 through July 9, 2016, Mitchell-Innes & Nash will hand over the gallery space to The Temporary Office of Urban Disturbances, an autonomous group formed in May 2016. The Temporary Office of Urban Disturbances presents If you can’t afford to live here, mo-o-ove! 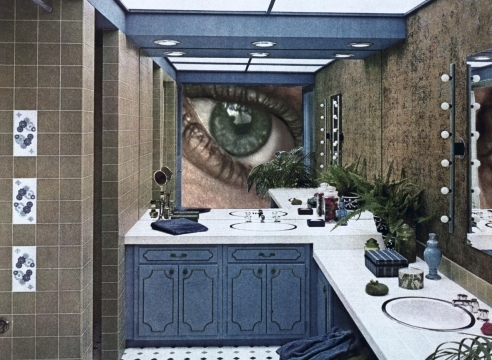 !, an exhibition expanding upon the living archive of artist Martha Rosler’s landmark three-show cycle entitled If You Lived Here…, first shown at the Dia Art Foundation in 1989. 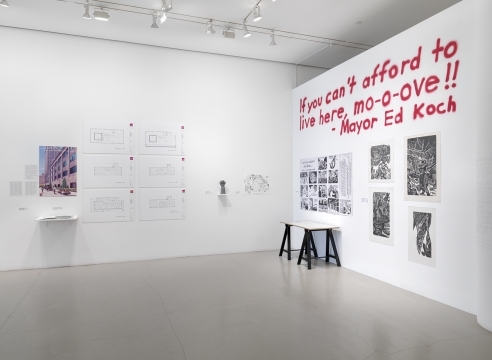 The present exhibition draws upon the rich documentary history of If You Lived Here… but will focus primarily on urgent questions of city life today. The Temporary Office of Urban Disturbances will host four town hall discussions throughout the course of the exhibition, on June 14, 16, 21, and 23 from 6 to 8 pm. The three original 1989 exhibitions constituting If You Lived Here… featured a wide range of participants and included a wealth of artworks, films and videos, flyers, books, and other documents. 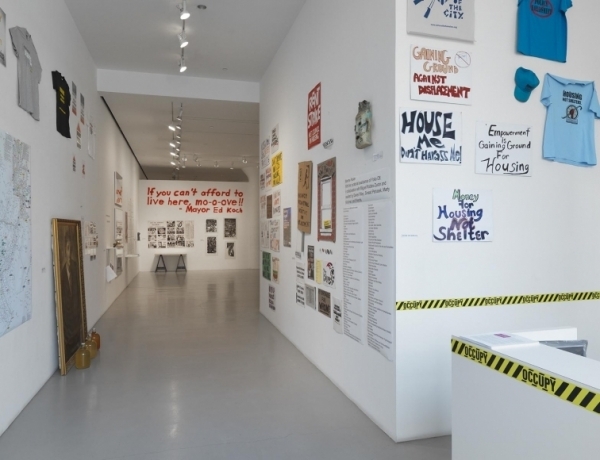 This exhibition will present a selection of original material as well as a series of public panels and discussions examining the increasingly fraught state of affairs for many city dwellers today. 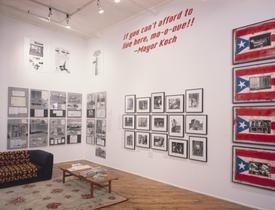 “If You Lived Here…,” was, in Yvonne Rainer’s words, “a vivid demonstration of how an art exhibition can constitute a radically different approach, one that can offer not only a diversity of objects but can contextualize a social field in and from which the objects are produced and derive their meaning. In other words, art exhibition does not have to separate, or isolate, its objects from the conditions in and under which those objects have been produced.”— Yvonne Rainer, “Preface: The Work of Art in the (Imagined) Age of the Unalienated Exhibition,” In If You Lived Here: The City in Art, Theory, and Social Activism, A Project by Martha Rosler (Bay Press, 1991). 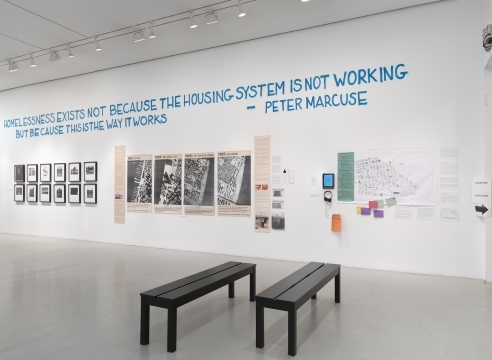 The present exhibition, like the initial showing, is structured in three parts: Home Front focuses on tenant struggles and gentrification; Homeless: The Street and Other Venues deals with homelessness, both visible and hidden; and City: Visions and Revisions addresses urbanism and development. The New Foundation Seattle recently presented the first two parts, and Mitchell-Innes & Nash is pleased to make the final part of the cycle possible. With the curatorial assistance of Yoko Ott, and in collaboration with Miguel Robles-Durán, assisted by Daniel Wiley, Sinead Petrasek, Marty Kirchner, and friends, Martha Rosler will present elements of all three parts, with an expanded exploration of contemporary urban conditions constituting the third part, City: Visions and Revisions. A series of town hall discussions dedicated to exploring themes present in the exhibition will take place at Mitchell-Innes & Nash, hosted by The Temporary Office of Urban Disturbances. Contributors to the exhibition include (list in formation): Cohabitation Strategies, Dan Wiley, Seattle/King County Coalition on Homelessness, LaToya Ruby Frazier, Artist Studio Affordability Project, 596 Acres, Inc., Jeanne van Heeswijk, Urban Homesteading Assistance Board, Met Council on Housing, Brooklyn Laundry Social Club, Sasha Sumner, Breaking Ground, Kelly Anderson, Natalie Bookchin, Jerry Pagane, Robbie Conal, Dona Ann McAdams, Kristin Reed, Andrew Castrucci, Rachael Romero, Gregory Sholette, Anton van Dalen, Picture the Homeless, New York City Community Land Initiative, ManSee Kong, Dina Bursztyn, Housing Works, Tenants & Neighbors, New Economy Project, FUREE, CAAAV, Community Voices Heard, Right to the City Alliance, Center for Urban Pedagogy (CUP), Design and Urban Ecologies students at Parsons, Community Service Society, Noah Fischer, Betty Yu, Andrea Robbins, Max Becher, Mel Rosenthal, Marilyn Nance, Third World Newsreel, and Karolyn Hatton. Thursday, June 23, 6-8 pm: Privatize! *All Town Hall Discussions will be live-streamed on the gallery's Facebook page. Named after its owners, a couple who formerly worked at the storied auction house Sotheby’s, this sky-lit space hosts a wide range of contemporary artists in shows that change roughly every month.